Fujian Province ranks as having the 4th greatest number of H7N9 cases since the first outbreak in the spring of 2013 (n=66), yet this year has been very quiet, with only 3 cases reported since October 1st of 2015 (see HK CHP Chart below). 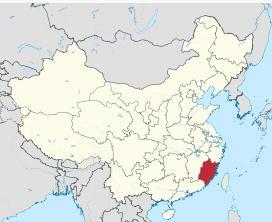 Overall, the number of H7N9 cases reported out of China this year is down. Whether this reflects a change in the virus, better bio-security at live bird markets, or simply a change in surveillance and reporting is impossible to say. Today, however, local media and the FAO are reporting a 4th case in Fujian Province, although I've yet to locate a report on the Fujian MOH website. At this point, few details are available. First the FAO report, then a translated media report. 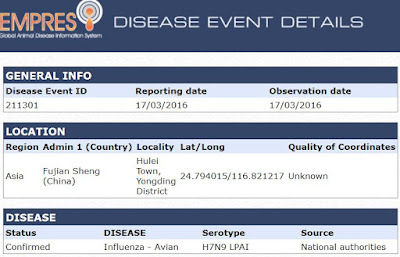 BEIJING, Longyan March 17 (Reporter Zhang Jinchuan) reporter from Longyan Municipal Propaganda Department informed that on the 16th, Yongding District Lake mine in the town of Longyan City, found a case of human infection with H7N9 avian influenza. Currently, the patient is in a hospital in Longyan. Avian flu reporting remains disappointingly sketchy out of China, but they are hardly alone in this regard. We remain equally unsure of Egypt's H5N1 situation as well (see FAO: 3rd Human H5N1 Case In Egypt In A Week). Meanwhile, in Sub-Saharan Africa, surveillance for avian flu in humans has been nearly non-existent (see WHO Scales Up Influenza Surveillance In Africa), and the same is true for large swaths of Asia and the Middle East. While Egypt and China remain the two global hot spots for Avian flu, in 2013's EID Journal: Predicting Hotspots for Influenza Virus Reassortment, we looked at a study which pinpointed six potential geographic foci for influenza reassortment. Their short list included the northern plains of India, coastal and central provinces of China, the western Korean Peninsula and southwestern Japan in Asia, and the Nile Delta in Egypt. Six reasons why global surveillance and reporting needs to be vastly improved if we are to avoid being blindsided by the next influenza pandemic.